This action game set in the streets of Mumbai City. 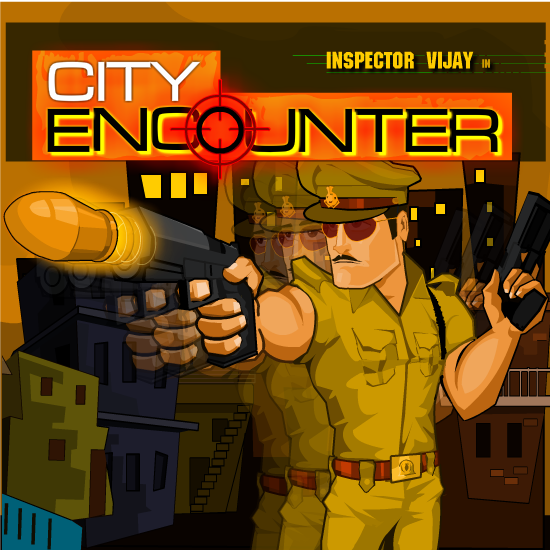 Inspector Vijay is an encounter specialist in Mumbai Police Department. An anonymous tip has taken him to the streets of the city where it turned out to be an ambush. Goons & terrorists had planned it perfectly but Vijay was not going to let it be the end of it. He needs help to stand against waves of enemies across the streets before the backup arrives. The goal of the game is to shoot all the terrorists and keep Vijay safe from their attacks. The weapons can be changed while playing. The game gets very challenging & interesting at higher levels. Guns, grenades, bullets, armor & helmets are available for purchase. To survive the enemy waves the player has to be very agile & make some strategical upgrade purchases. The character Inspector Vijay is heavily influenced by the Bollywood film Dabaang.